In the aftermath of the Rwandan genocide, the Canadian government commissioned the departments of Foreign Affairs and National Defence to investigate the feasibility of a United Nations rapid-response service. The research was co-directed by Peter Langille, an academic and defence analyst known as a critic of NATO’s military doctrine, a key figure in the development of the Pearson Peacekeeping Centre, and a national expert on UN peace operations. Langille and his team realized early on that such a service was both possible and necessary, as events in Rwanda and Srebrenica had already grimly proved, but would require three things: a compelling concept; a broad base of national and global support; and the strength to withstand the inevitable opposition. 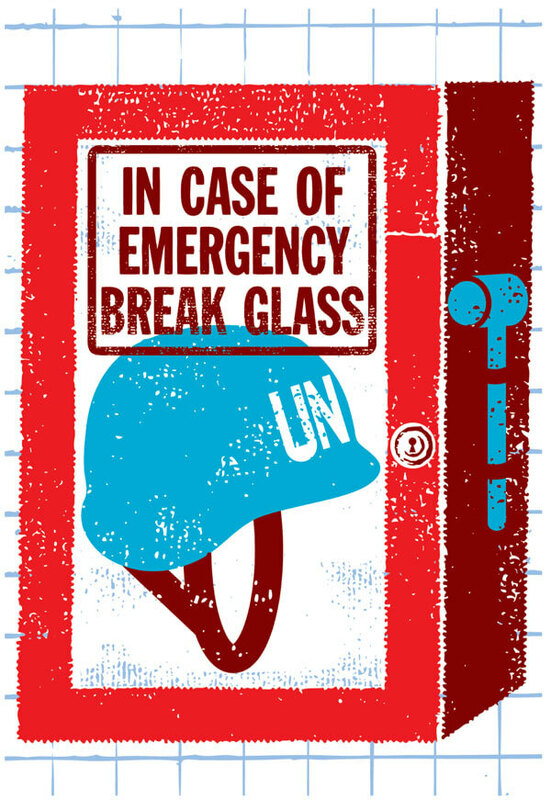 The United Nations Emergency Peace Service, as the initiative came to be called, is imagined as the UN’s answer to 911: a permanent first responder, capable of deployment within 24 hours of authorization from the UN Security Council. Langille, whose slow, deliberate speech suggests years of explaining concepts that people don’t or won’t understand, stressed that UNEPS would be a service, not an armed force, meant to complement existing national and UN arrangements. “It would draw on the best and brightest of individuals who volunteer for a dedicated UN service—military, police, and civilians who are well-prepared, highly trained, and likely more sophisticated [than national armed forces] in addressing a wide array of emergencies,” he says. Despite strong endorsements from a number of high-ranking UN officials, politicians, and prominent peace researchers, UNEPS has yet to get off the ground. “We haven’t attracted the broader organizational support required, the funding necessary, the backing of key member states,” explains Langille. Apparently, there are threats implied in anti-militarist global cooperation. “Some see this as a harbinger of world governments, or a stronger UN that might actually work. Some don’t favour that system.” This is unfortunate, because UNEPS proponents see it as the best means of preventing another Rwanda. Off the top of his head, Langille lists other recent crises where UNEPS could have helped: East Timor, Sierra Leone, the Democratic Republic of Congo, Darfur, Ivory Coast, Haiti. “It’s not hard to go on,” he says. When Langille visited the UN in December, it was clear to him that interest in UNEPS was up. There’s a new emphasis in global politics on protecting civilians from war, he says, and more and more groups are calling for the creation of a UN standing force to deal with humanitarian crises. Still, the need for advocacy remains; the general public must be made to understand that an alternative to current defence arrangements exists, that it’s been derived from the experience of UN officials and various defence establishments, and that it addresses, sustainably, the urgent requirements of collective global security. It was comforting, at the end of our conversation, to know that some answers remain so simple. Linda McQuaig Then: This Magazine editor at large. Now: Toronto Star columnist. Co-author of The Trouble with Billionaires (2010). Katie Addleman is a freelance writer. She previously wrote about electoral reform and drug legalization for This Magazine.